Introduction to chemical finishing; Chemical finishing processes; Softening finishes; Hand building finishes; Easy-care and durable press finishes of cellulosics; Repellent finishes; Soil release finishes; Flame retardant finishes; Nonslip finishes; Antistatic finishes; Antipilling finishes; Elastomeric finishes; Finishes to improve colour fastness; Ultraviolet protection finishes; Antimicrobial finishes; Insect resist and mite protection finishes; Finishing with enzymes: Bio-finishes for cellulose; Novel finishes; Actual and future trends in chemical finishing. The role of the textile finisher has become increasingly demanding, and now requires a careful balance between the compatibility of different finishing products and treatments and the application processes used to provide textiles with desirable properties. 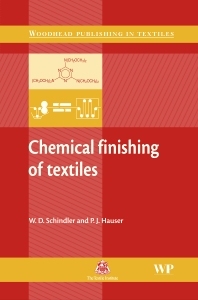 In one comprehensive book, Chemical finishing of textiles details the fundamentals of final chemical finishing, covering the range of effects that result from the interplay between chemical structures and finishing products. After an introductory chapter covering the importance of chemical finishing, the following chapters focus on particular finishing techniques, from softening, easy-care and permanent press, non-slip and soil-release, to flame-retardant, antistatic and antimicrobial. Within each chapter, sections include an introduction, mechanisms, chemistries, applications, evaluations and troubleshooting. The book concludes with a chapter on the future trends in chemical finishing. Chemical finishing of textiles is an essential reference for all academic and industrial textile chemists and for those studying textile education programmes. Dr W. D. Schindler is Professor of Textile Chemistry and Textile Finishing at the University of Applied Sciences Hof, Germany. His main research interests are the chemistry of fibres, dyestuffs, textile auxiliaries, chemical finishing and textile chemical analysis. He published 39 papers and claimed several patents on new textile developments. Dr P. J. Hauser teaches undergraduate and graduate courses in the chemistry of textile wet processing at North Carolina State University. He has numerous scientific publications and patents in the area of high performance textile chemicals for enhanced product value.